I was thinking about not posting this, because we had to kind of improvise a bit and it doesn’t look pretty, but Mary Kate wanted to see it, and I haven’t been cooking a ton of things worth sharing lately (lotta gross vegetables), so… here we go! Oh, and as the title suggests, from here on out the pictures may be pretty unappealing. This thing had a face. 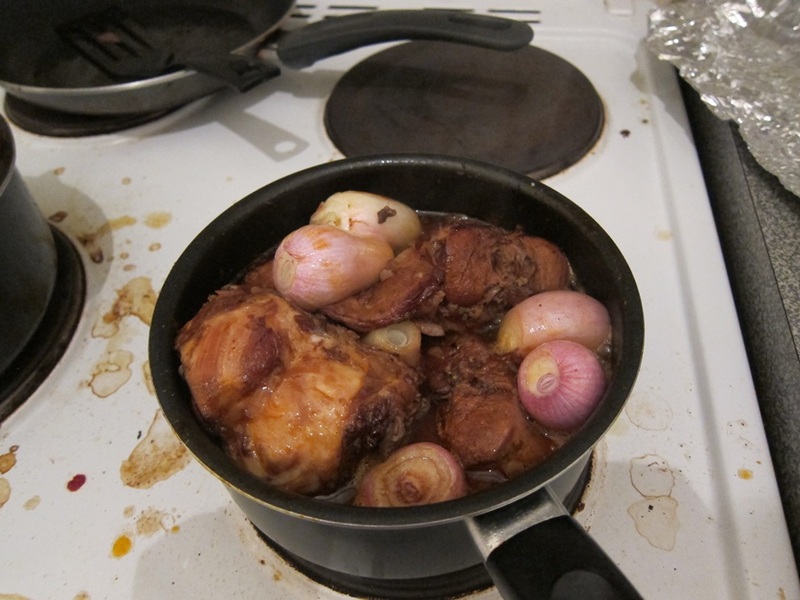 Besides not having the right pots and pans (which will quickly become apparent) we didn’t have allspice and had shallots rather than pearl onions. 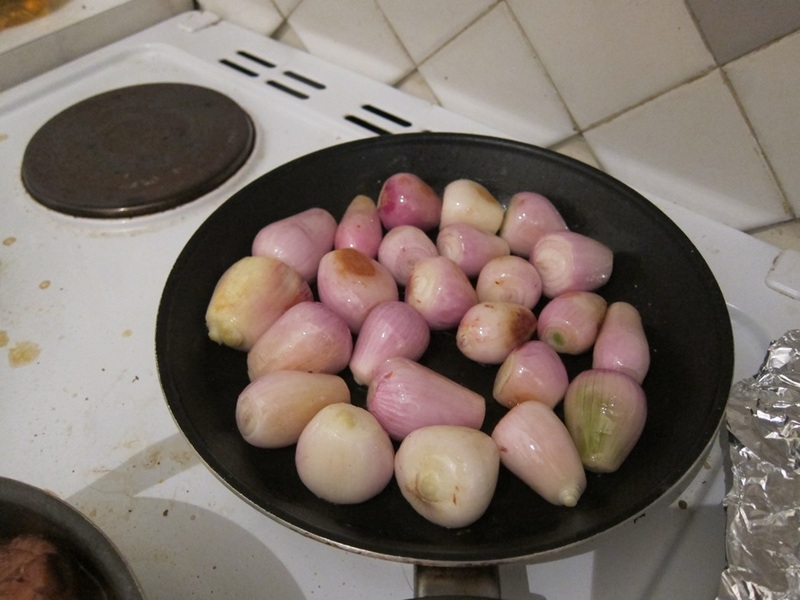 I have never eaten as many shallots in my life, but…they’re fine/good? The meat counter guy didn’t speak English, but mimed chopping, so I went with that. 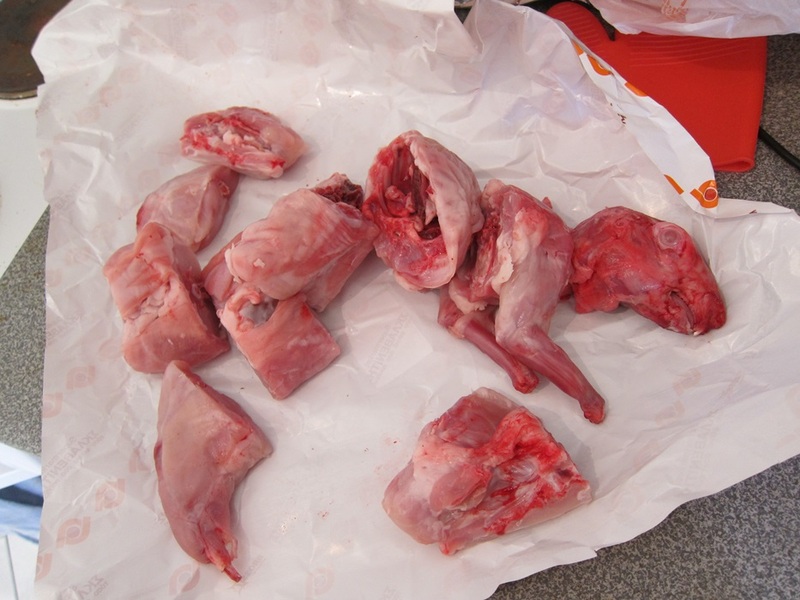 Rinse the rabbit and put them in a large bowl with the bay leaves and vinegar. Mix well, and leave to marinate at least 2 hours, up to overnight. Heat 1/4 cup of the olive oil in a large saucepan until hot. 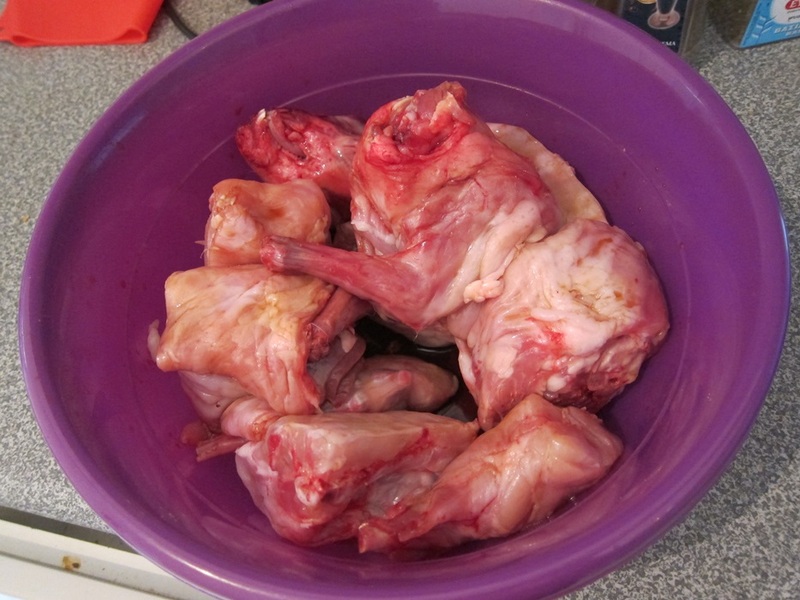 Pat dry the rabbit piece them and add to the oil, frying until brown on all sides. We didn’t have anything big enough, so were using two pots at once, and still having to rotate meat in and out of the pots so that everything could be heated on the bottom. Once the meat is all browned on the outside, add the tomato paste, bay leaves, sugar, garlic, spices, wine, and water, then season with salt and pepper. I added more water, since they were split and it seemed like it could use it to cover most of the meat. Bring the mixture to a boil, then reduce the heat to a simmer, cover, and simmer for about an hour. 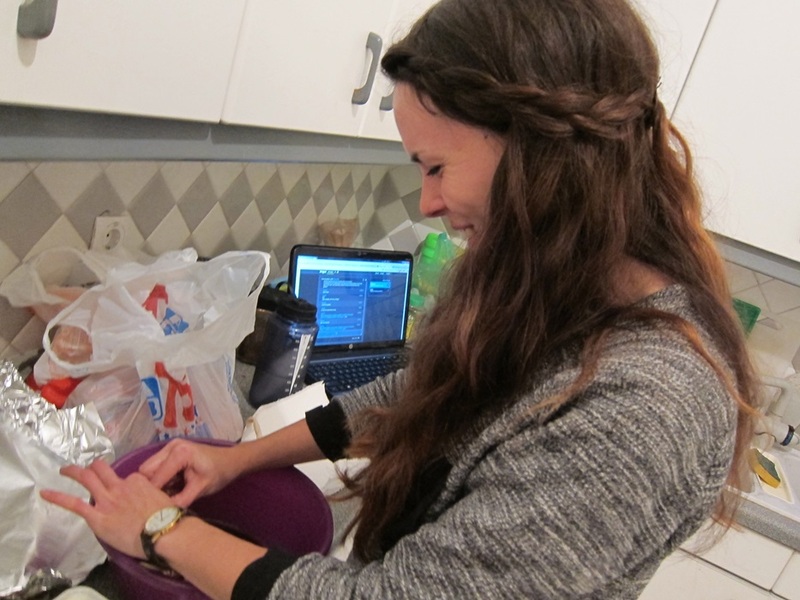 When 15 minutes remain, heat the remaining 1/4 cup of olive oil in a frying pan and add the onions. Saute gently for 15 minutes, stirring occasionally, until golden all over. 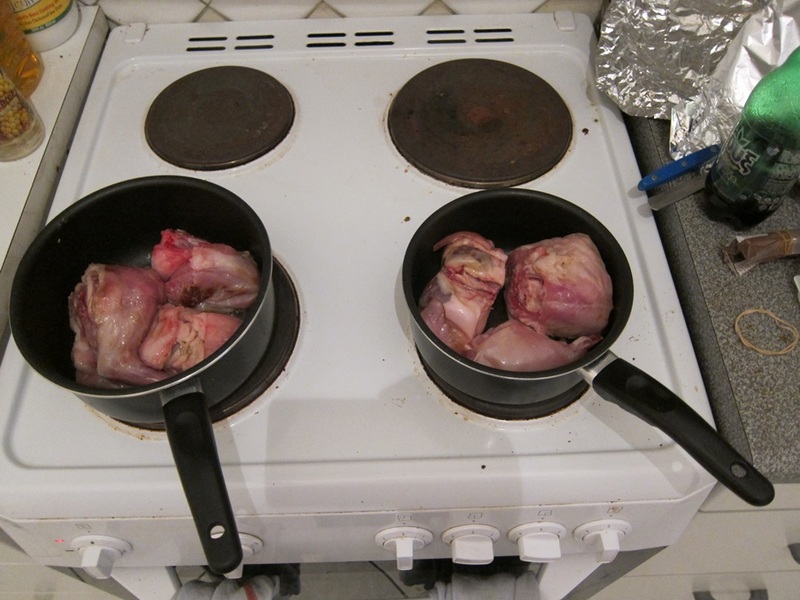 Add the onions, and any remaining oil in the pan, to the rabbit mixture. Re-cover, and simmer a further 15 minutes. Remove the cinnamon stick, allspice, and rosemary. This would be good with rice, and even better with some crispy potato wedges! The sauce is delicious (dip potatoes in it! 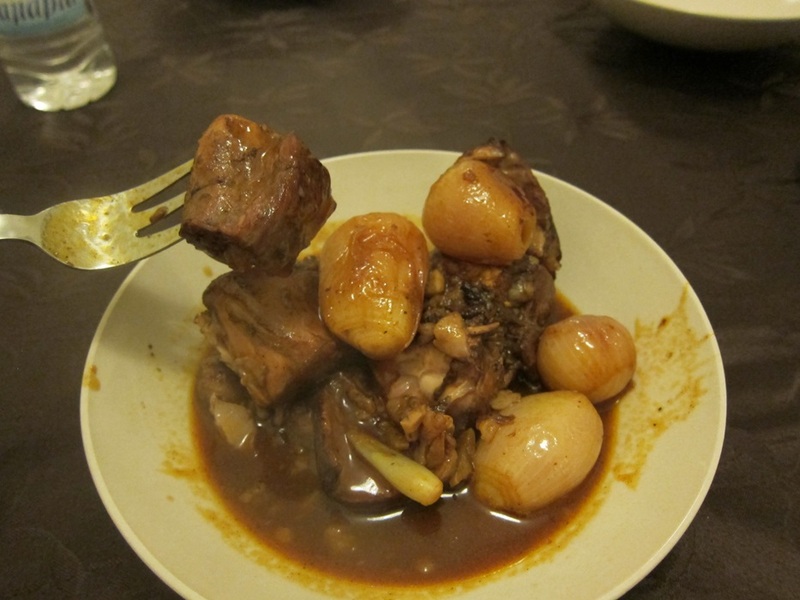 ), and the meat is nice and tender. Even with the problems my kitchen has, this was a good meal! Heat 1/4 cup of the olive oil in a large saucepan until hot. 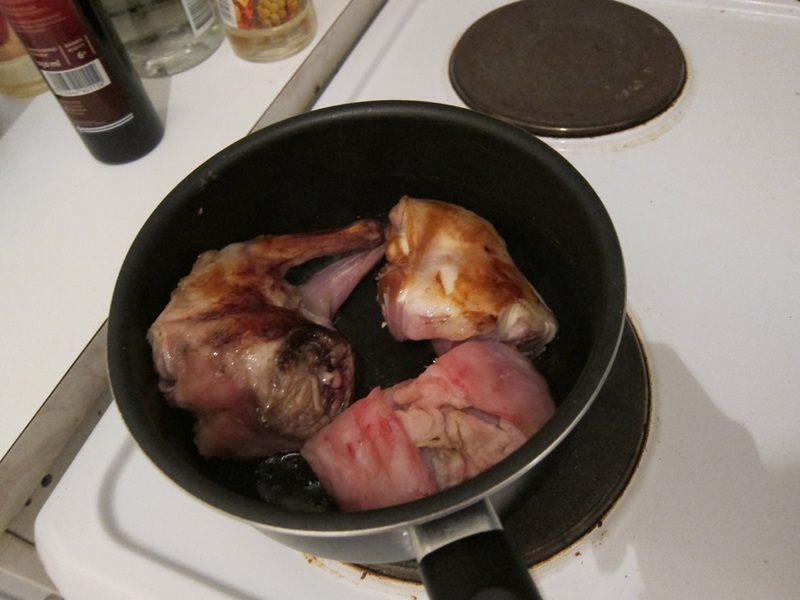 Pat dry the rabbit piece them and add to the oil, frying until brown on all sides. Once the meat is browned all around, add the tomato paste, bay leaves, sugar, garlic, spices, wine, and water, then season with salt and pepper. Bring the mixture to a boil, then reduce the heat to a simmer, cover, and simmer for about an hour. When 15 minutes remain, heat the remaining 1/4 cup of olive oil in a frying pan and add the onions. Saute gently for 15 minutes, stirring occasionally, until golden all over. 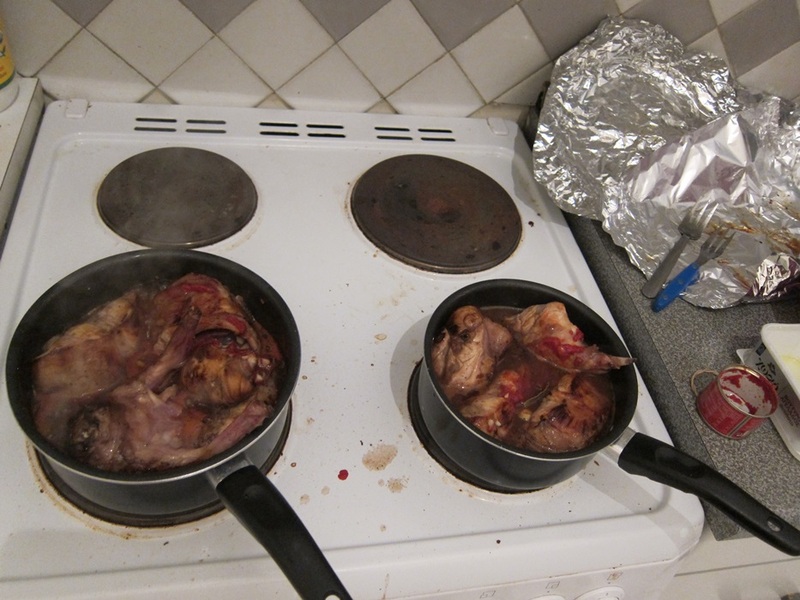 Add the onions, and any remaining oil in the pan, to the rabbit mixture. Re-cover, and simmer a further 15 minutes. Remove the cinnamon stick, allspice, and rosemary. Serve with rice or potato. 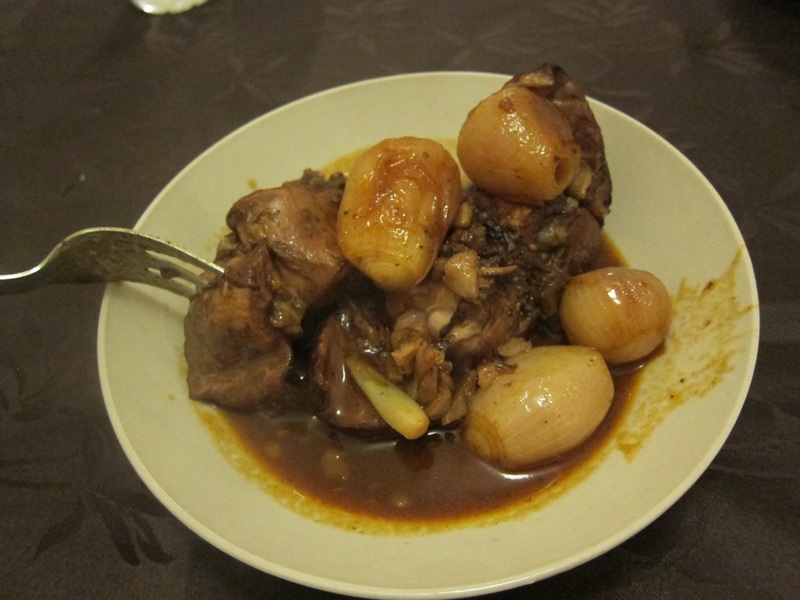 This entry was posted in Dinner and tagged ick, incidentally gf, nsfw, rabbit, stifado. Bookmark the permalink. YAY! Peer pressure for the win. That’s really interesting, overall, but yeah, the teeth photo kind of makes it gross. And that is a ton of shallots. By “jointed,” you mean more-or-less cut into parts, right? Because I don’t think there’s a version of rabbit, no matter how evil, that comes without joints. Though Odo from DS9 could probably become a rabbit, and he has no joints. Sauce does sound really good. I think in general it would mean cut at the (major) joints, but that would make too-large pieces. So…big chunks. Oh, this makes me laugh, so hard on so many levels! But it does sound really good!